Background: What follows is a copy of a letter that was written by a young Marine to his mother while he was hospitalized after being wounded on a Korean battlefield in 1950. It came into the hands of a Navy Chaplain, who read the letter before 5,000 marines at a San Diego Naval Base in 1951. The Navy Chaplain had talked to the boy, to the boy's mother and to the sergeant in charge of the patrol. This Navy chaplain, Father Walter Moldy, would always assure anyone who asked that this is a true story. I wouldn't dare write this letter to anyone, but you because no one else would believe it. Maybe even you will find it hard, but I have got to tell somebody. First off, I am in a hospital. Now don't worry. I was wounded but, I am okay you understand. Okay. The doctor says that I will be up and around in a month. But that is not what I want to tell you. Remember when I joined the marines last year; remember when I left, how you told me to say a prayer to St. Michael every day. You 't have to tell me that. Ever since I can remember you always told me to say the prayer to St. Michael the Archangel. You even named me after him. Well I always have. When I got to Korea, I prayed even harder. Remember the prayer that you taught me? "Michael, Michael of the morning fresh corp of Heaven adorning," you know the rest of it. Well I said it every day. Sometimes when I was marching or sometimes resting. But always before I went to sleep. I even got some of the other fellas to say it. Well one day I was with an advance detail way up over the front lines. We were scouting for the Commies. I was plodding along in the bitter cold; my breath was like cigar smoke. I thought I knew every guy in the patrol, when alongside of me comes another marine I never met before. He was bigger than any other Marine I had ever seen. He must have been 6’4” and built in proportion. It gave me a feeling of security to have such a body near. Anyway, there we were trudging along. The rest of the patrol spread out. Just to start a conversation, I said “cold ain’t it.” And then I laughed. Here I was with a good chance of getting killed any minute and I am talking about the weather. I was too amazed to say anything to say anything for a minute. How did he know my name, and a prayer that you had taught me? Then I smiled to myself. Every guy in the outfit knew about me. Hadn’t I taught the prayer to anybody who would listen. Why now and then, they even referred to me as St. Michael. Neither of us spoke for a time and then he broke the silence. “We are going to have some trouble up ahead.” He must have been in fine physical shape or he was breathing so lightly, I had couldn’t see his breath. Mine poured out in great clouds. There was no smile on his face now. Trouble ahead, I thought to myself, well with the Commies all around us, that is no great revelation. Snow began to fall in great thick globs. In a brief moment, the whole countryside was blotted out. And I was marching in a white fog of wet sticky particles. My companion disappeared. “Michael,” I shouted in sudden alarm. I felt his hand on my arm, his voice was rich and strong. “This will stop shortly.” His prophecy proved to be correct. In a few minutes the snow stopped as abruptly as it had begun. The was hard shining disc. I looked back for the rest of the patrol. There was no one in sight. We lost them in that heavy fall snow. I looked ahead as we came over a little rise. Mom, my heart stopped. There were seven of them. Seven Commies in their padded pants and jackets and their funny hats. Only there wasn’t anything funny about them now. Seven rifles were aimed at us. “Down Michael,” I screamed and hit the frozen earth. I heard those rifles fires almost as one. I heard the bullets. There was Michael still standing. Mom, those guys couldn’t have missed, not at that range. I expected to see him literally blown to bits. But there he stood, making no effort to fire himself. He was paralyzed with fear. It happens sometimes, Mom, even to the bravest. He was like a bird fascinated by a snake. At least that was what I thought then. I jumped up to pull him down and that was when I got mine. I felt a sudden flame in my chest. I often wondered what it felt like to be hit, now I know. I remember feeling strong arms about me; arms that laid me ever so gently on a pillow of snow. I opened my eyes, for one last look. I was dying. Maybe I was even dead; I remember thinking well, this is not so bad. Maybe I was looking into the sun. Maybe I was in shock, but it seemed I saw Michael standing erect again only this time his face was shining with a terrible splendor. As I say, maybe it was the sun in my eyes, but he seemed to change as I watched him. He grew bigger, his arms stretched out wide, maybe it was the snow falling again, but there was a brightness around him like the wing of an angel. In his hand was a sword. A sword that flashed with a million lights. Well, that is the last thing I remember until the rest of the fellas came up and found me. I do not now how much time had passed. Now and then I had but a moment’s rest from the pain and fever. I remember telling them of the enemy just ahead. I didn’t say anything, what could I say. I could only look open mouthed with amazement. It was then the sergeant spoke again, ‘Kid, ” he said gently, “everyone of those seven Commies was killed by a sword stroke. That is all I can tell you, Mom. As I say it may have been the sun in my eyes; it may have been the cold or the pain, but that is what happened. 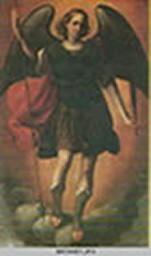 Saint Michael the Archangel, defend us in battle. Be our safe guard against the wiles and wickedness of the devil. Restrain him O God, we humbly pray, and do thou, O Prince of the Heavenly host, by the power of God, cast into Hell Satan and all the evil spirits, who prowl about the world seeking the ruin and destruction of souls. Amen. We should make it our duty to join fervently in this important prayer, repeating it often each day. In our morning and evening prayers, too we invoke St. Michael when saying the Confiteor. This we should try to do with devotion and confidence. Many do not even think of what they are saying when they recite these prayers? We all must die and so we all must be prepared for the fierce attacks of the devil at the dreadful hour. Hence, every Christian should make sure of having St. Michael's help at the hour of death. This we can do by being devoted to the great archangel during our lives.